If you’ve asked me a few weeks ago if I’d give Clearasil a whirl I would’ve laughed in your face. Clearasil is a brand that reminds me of spotty teenage boys, badly fitting bras, angst and Dawson’s Creek. I didn’t even use it as a teenager, because it was too harsh for my sensitive girlie skin, and in my brain it’s as powerful as pain stripper and smells pretty similar too. So when I was sent info on their new ‘all in one’ face wash, which you can either use normally as a wash or leave on for one minute as a treatment mask, I was intrigued to see if it really had improved from the 1990’s. Well guys and gals, it has… the brand has moved on a little bit since it was last on the face of my teenage friends and it looks all grown up. The ‘all in one’ face mask is actually quite good, being a pearlescent and light cream which lathers well and moves around your face stripping away the nasties easily. I expected it to be drying but it’s not at all – my skin felt refreshed and clean as a button after. What is really cool though (kids, do you still use that word?) is that you can slap it on your mug like a face mask and leave for about one minute for a really intense deep clean. Considering it’s a face wash too it’s surprisingly easy to put it on like a face mask, although it doesn’t dry so you have to be careful to not catch it or itch your nose for the full sixty seconds! 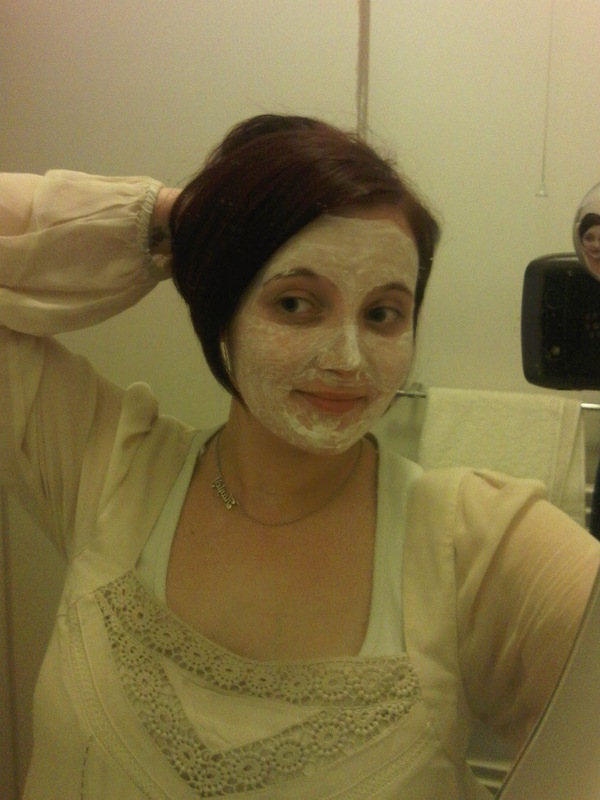 After the minute my face felt clean and refreshed, although I couldn’t tell a visible difference. If you’re a spotty teenager this may have more of a positive effect on you though, as I don’t have much to test it on. It’s a good product if you’re prone to breakouts around that time of the month, or if you’ve got an oily face. The other product in the range is the Ultra Rapid Treatment Cream which claims to reduce the size of spots in just 4hrs. I’ve had a couple of nasties pop up over the last week (thanks mental working hours, lack of sleep and Haribo) so I’ve been able to put this to the test… I got a bad boy on my chin right before a night out so I put a blob of this on with the applicator, let it dry and went to bed. When I awoke from my slumber the spot had gone down in size and redness considerably – so much so that it was barely visible with a bit of concealer over it. 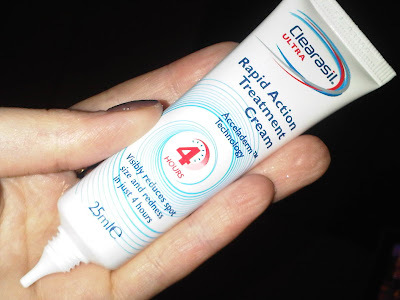 I’ve used it a couple of times since, and although it doesn’t completely get rid of the spot, it certainly reduces the size, pain and redness of it. 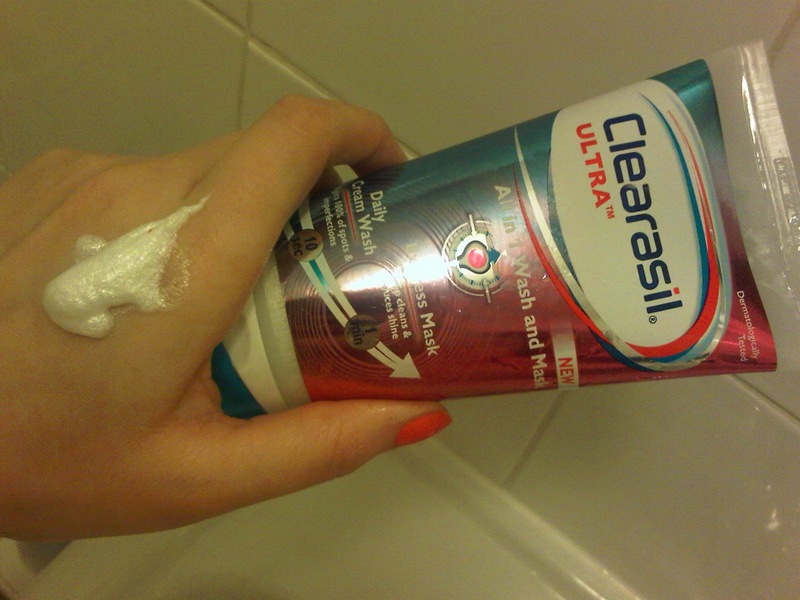 I have to say that overall I’m impressed with Clearasil and will now be looking at it differently. It’s not just for kids that need to cut their hair and pull up their trousers, there’s room on LBQ’s bathroom shelf for a little bit of spot treatment too. I have tried their blemish treatment and found it really effective. Currently I am using the Clean and Clear Deep Clean Cream Wash and it seems to be very similar to this. I have acne prone skin and it does help a lot to reduce them 🙂 Thanks for the review! You're welcome! I think they still have a lot of good products for those of us with a few pimples, whereas I think I used to associate it with proper acne! You are such a babe in that mask ;)I had the same experience with Clearasil when I was a teen, that blue lotion in a bottle used to make my face all itchy and red. Not good.